Biography of Flemish Religious Painter. Close-up of the Virgin Mary. A representative of the school of Flemish Painting, Roger van der Weyden was one of the top Flemish painters involved in the Northern Renaissance of the 15th century. Influenced by the works of Robert Campin (Master of Flemalle) (c.1378-1444), and Jan Van Eyck (1390-1441), he was active in Florence and Ferrara, as well as Brussels. Renowned for his slender elegant figures and interior perspective, he is best known for his colourful panel paintings, usually altarpieces, on Biblical subjects. In his altarpiece art, Weyden ranks with the greatest of all Northern Renaissance artists. Together with Robert Campin, Hans Memling, Hugo van der Goes and Hieronymus Bosch, he created some of the greatest Renaissance paintings in Western Europe, and became one of the most influential artists of the Netherlandish Renaissance. 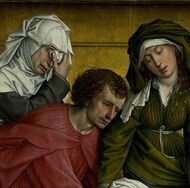 Weyden's masterpiece, strongly influenced by Robert Campin, is undoubtedly Descent from the Cross (1435-40). Famous for its sculpted figures, and strong primary colours (reds, whites, blues), its originality, power and influence stems from the highly realistic facial features and emotions of its figures, notably the Virgin Mary. The painting had a huge impact on Biblical art of the Flemish School and on other European movements like the Cologne School of Painting (c.1350-1500). Some of his other great masterpieces of religious art include The Annunciation Triptych (1435-40, Paris and Turin), The Seven Sacraments Altarpiece (1445, Koninklijk Museum of Fine Arts, Antwerp), The Lamentation Before the Tomb (1450, Uffizi Gallery, Florence) and The Beaune Altarpiece (Altarpiece of the Last Judgement) (1450, Chapel at Hotel Dieu, Beaune, France), and The Adoration of the Magi (The Columba Altarpiece) (c.1455, Alte Pinakothek, Munich). He is now considered to be one of the very best history painters of the Flemish School. Born in Tournai, Holland in 1400 his father worked as a knife manufacturer. Although little is known Weyden's life, it is believed he was also known as 'Rogelet de la Pasture', who was a pupil of artist Robert Campin (Rogier van der Weyden and Rogelet de la Pasture being the Flemish and French translation, respectively, of Roger of the Meadow). Records show that Rogelet de la Pasture obtained his title of Master Painter in 1427. Following his apprenticeship, he moved to Brussels, and was appointed painter to the city around 1436. Although historians are unable to verify how many (if any) paintings can definitely be attributed to Roger as he did not sign or document his works, it is clear that by 1436 he was already quite wealthy, and obviously successful. At that time, Brussels was mainly Flemish speaking, so he became known by his Dutch name, Rogier van der Weyden. 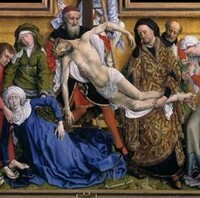 It is generally accepted that the Descent From the Cross, for the Church of Our Lady Without the Walls in Louvain (now in the Prado Museum, Madrid) is a work by his hand. Where Van Eyck strove to express his art through a dispassionate realism, Weyden's painting was characterized by rich colour and dramatic style. He went on to paint many serene, aristocratic portraits of the Burgundian Dukes, their relatives, friends and courtiers. Apart from one trip to Italy in 1450, it is thought he never left Brussels again, although his paintings were sent all over Europe and were extremely popular. Van der Weyden died in 1464. His expressive style of painting influenced other Old Masters for years to come. It is believed in particular that he influenced the painters Petrus Christus (c.1410-75) and Hans Memling (who may have been a pupil), as well as the engraver Martin Schongauer, whose prints were very much in keeping with van der Weyden's style and were disseminated all over Europe. Van der Weyden's earliest surviving works are probably a pair of small diptychs of The Virgin and Child and St Catherine in a Landscape (Kunsthistorisches Museum, Vienna) and The Virgin and Child (Thyssen-Bornemisza Collection, Lugano) and St George and the Dragon (National Gallery of Art, Washington). The presence of a number of formal motifs, the handling of light, and the tiny scale of both works betray a knowledge of the work of Jan van Eyck; the facial types of the women and the handling of their drapery indicate a closer association with Robert Campin. A similar combination of influence appears in another early work, the Louvre Annunciation. In a number of respects, this picture seems like a critique of the central panel of Campin's Merode Altarpiece, with the more glaring perspectival errors of its predecessor eliminated. By the time of van der Weyden's St Luke Drawing a Portrait of the Virgin (Museum of Fine Arts, Boston) the influence of Campin has become vestigial, while that of Jan van Eyck is paramount. The basic composition is a paraphrase of the latter's The Madonna of Chancellor Rolin (1435; Louvre, Paris). Despite this obvious borrowing, St Luke Drawing the Virgin exhibits a linear expressiveness absent in its more composed model. 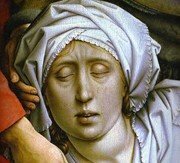 It imparts an emotional tension characteristic of van der Weyden's personal style. This tendency reaches its ultimate expression in the artist's greatest surviving work, the Descent From the Cross (Deposition) in the Prado, Madrid. Probably painted in the second half of the 1430s, this altarpiece was commissioned by the Louvain Archers' Guild. Rejecting a naturalistic landscape setting, van der Weyden compresses the ten nearly life-size figures in his composition within a gilded niche simulating the appearance of a sculptured altarpiece of polychromed wood. The tightly interlocked figures seem to seethe in a single convulsion of pain which brutally drives home the anguish of the Passion. Although the Descent from the Cross is a work of immense formal and colouristic richness, these characteristics are subordinate to the fundamentally emotional purpose of the design. In its compact composition, purity of colour and intensity of emotion, Weyden's Descent From the Cross (Deposition) must be one of the greatest religious paintings in the history of Western art. Van der Weyden was an extremely prosperous master by 1441, but records of this period indicate that he did not disdain to polychrome sculpture and paint banners. During the years 1439 to 1441 he worked on the four panels of The Justice of the Emperor Trajan and Count Herkinbald which, until their destruction in 1695, decorated Brussels Town Hall. An item of tapestry art in Bern records parts of this series, though in a much distorted form. The loss of these pictures is doubly unfortunate, both on account of their evident quality - which is described by several chroniclers - and because they constituted the only major secular narrative cycle that the artist is known to have painted. In 1445 King Juan II gave an altarpiece by master "Rogel" to the charterhouse at Miraflores near Burgos, which indicates that van der Weyden's fame had spread as far as Castile. This work is identical with one of two versions of a triptych dedicated to the Virgin (the smaller in the Staatliche Museen, Berlin, and the larger divided between the Royal Chapel, Granada, and the Metropolitan Museum of Art, New York). During the late 1440s he painted the enormous Last Judgment altarpiece, which stands in the hospital founded by the Burgundian Chancellor Nicolas Rolin at Beaune, near Dijon. With its gold background, its sculptural associations (the main composition derives from Gothic tympanum reliefs), and its great emotional intensity, this work is comparable with the earlier Descent from the Cross. Documents reveal that at least one altarpiece by van der Weyden had been exported to Ferrara by 1449. They also show that in 1450 and 1445 he received payments from the Este Court, which were perhaps connected with this lost work. In 1450 he was in Rome, where he is supposed to have admired frescos by Gentile da Fabriano. It is unlikely that this visit lasted long; he probably visited Florence on the same journey. Two of his surviving works were painted for the Medici: the Madonna and Child with Four Saints (Stadelsches Kunstinstitut, Frankfurt am Main) and the Entombment (Uffizi, Florence). Both were probably painted shortly after his return home, and then shipped to Florence. Although they include certain iconographic motifs derived from Italian art, neither suggests that the artist was particularly interested in the new style of Renaissance art in Florence. A picture such as the Seven Sacraments Altarpiece (Royal Museum of Fine Arts, Antwerp) probably painted for the Bishop of Tournai in the early 1450s, reveals the continued influence of Jan van Eyck. In the central panel, the placing of the large-scale figures against a vista down a church nave is based upon Jan van Eyck's Madonna in Church (1425-30; Staatliche Museen, Berlin). By extending this basic idea to embrace all three panels, van der Weyden recast the traditional narrative divisions of the triptych format in a way that suggests a section through the nave and aisles of a Gothic church. His Braque Triptych (Louvre, Paris) is probably of similar date. In this small altarpiece, half-length figures of Christ and the saints are set against a distant landscape background in a remarkably original way. It seems probable that later Northern half-length portraits in a landscape setting, which became common at the turn of the 15th and 16th century, derive ultimately from this painting or a related one by the same artist. With the St John Altarpiece in the Staatliche Museen, Berlin, van der Weyden returned to the format of a simulated triple portal containing three scenes, similar to the one he had employed a decade earlier in the altarpiece of the Virgin for Miraflores. However, the scenes depicted are visually more complex than those in the Miraflores altarpiece. Increased formal and iconographic complexity is also characteristic of the Berlin Bladelin Triptych (Staatliche Museen). By comparison, the diptych of Christ on the Cross and St John and the Virgin (Private Collection, Philadelphia) is a very austere composition, with every non-essential detail eliminated. Rogier's last major work is the St Columba Altarpiece. Probably painted in about 1460 for a church in Cologne, it is now in the Alte Pinakothek, Munich. Reminiscences of the whole span of the artist's work, are combined in this altarpiece. It is a magisterial work, distinguished by exquisite formal and colouristic harmonics. Works by Roger van der Weyden can be seen in the best art museums across Europe and America. They include: Diptych with the Virgin and Child Standing in a Niche (c.1430, Kunsthistorisches Museum, Vienna), Crucifixion (c.1430, Staatliche Museen zu Berlin), Lady Wearing a Gauze Headdress (c.1435, Gemaldegalerie, SMPK, Berlin), The Annunciation Triptych (c.1435-40, Paris and Turin), Descent from the Cross (The Deposition) (c.1440, Prado Museum, Madrid), Saint Luke Drawing the Portrait of the Virgin (c.1440, Boston Museum of Fine Arts), The Seven Sacraments Altarpiece (1445, Koninklijk Museum of Fine Arts, Antwerp), The Lamentation Before the Tomb (1450, Uffizi Gallery, Florence) and The Beaune Altarpiece (Altarpiece of the Last Judgement) (1450, Chapel at Hotel Dieu, Beaune, France), Virgin and Child (c.1454, Museum of Fine Arts, Houston), Portrait of a Lady (c.1455, National Gallery of Art, Washington DC) The Adoration of the Magi (The Columba Altarpiece) (c.1455, Alte Pinakothek, Munich) and Francesco d'Este (c.1460, Metropolitan Museum of Art, New York). Van der Weyden was the third of the great trio of painters who founded the early school of Flemish painting. Although he drew upon Campin and van Eyck, his elegant and emotive style is quite distinct, and his influence - on contemporaries like Dieric Bouts (1410/20-75) and others - was enormous. His many exported works, and his large workshop, which drew artists even from Italy, broadcast his style throughout Europe. It would be no exaggeration to state that he was the most influential Northern painter of the 15th century and - along with Jan Van Eyck (see his Ghent Altarpiece), and the mysterious Hugo Van Der Goes (see Portinari Altarpiece).  For important dates and a chronological list of events, see: History of Art Timeline.